1. 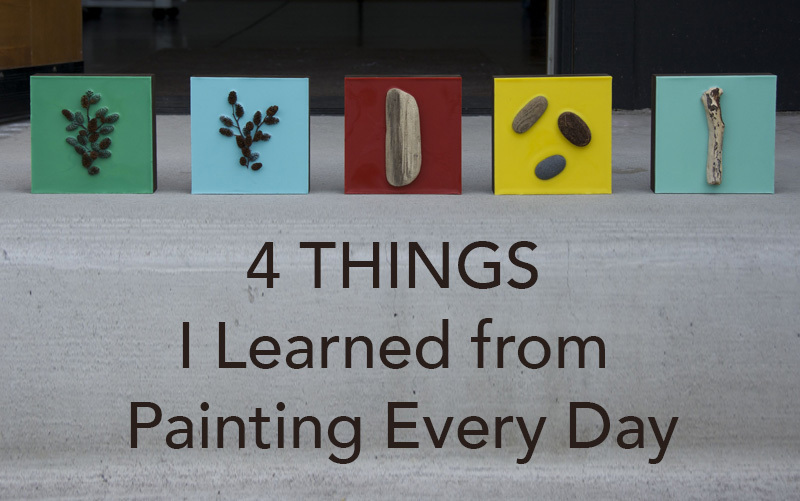 Painting every day allowed me to take risks and fail. Creating a piece of artwork every day made me think more about variety. I thought about my color frequency and how those colors related to the larger group. 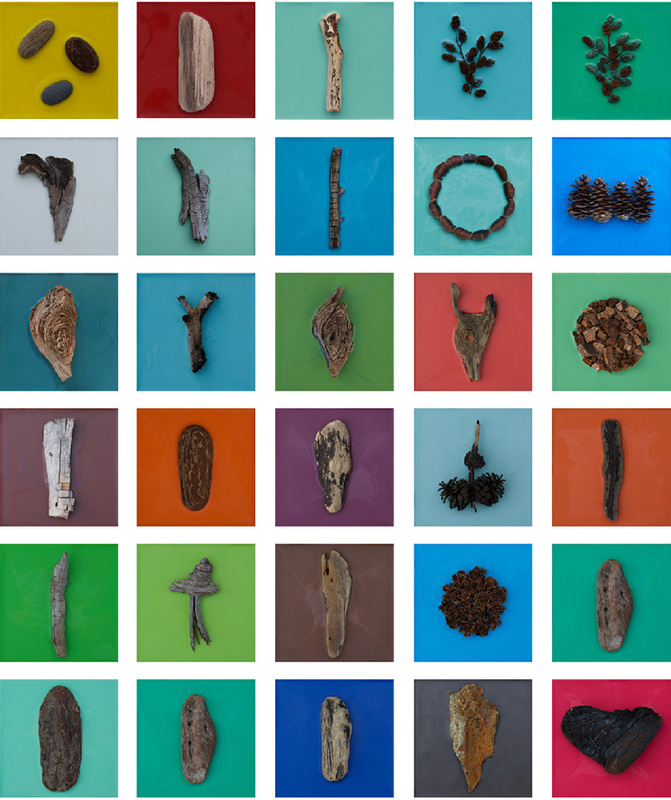 I experimented with different applications of found objects, like grouping rocks or pine cones in a tight circle. The pine cones turned out amazing and the rocks flopped. Because I was creating so much work it didn’t bother me that the rocks (and a few other pieces) were unsuccessful. When I don’t paint often or produce a lot of work the pieces become more precious and it’s harder to accept the failures. 2. Writing every day makes writing easier. It is similar to training for a 5k, in the beginning running feels awful but the more you do it the better you feel and the easier it becomes. 3. Writing about my art every day forced me to become better at talking about my work. I’ve always had a really hard time talking about or describing my work. I used to feel like the viewer should be able to get everything they need from my artwork just by looking at it. I could make a case for that, like other artists have but the truth is we like to connect with art and it helps to know more about the work in order to make that connection. I know that because I love learning more about other artists work but I was lazy when telling my own story. I don’t know if it was because I was scared of being judged, or I felt like maybe my story wasn’t interesting enough but it has taken me since 2005 to be able to confidently talk about what I’m creating and why. 4. It’s worth the effort to get my work out there. What I mean by out there is using social media, blogging and online art websites. Often times I will create a new painting and if it isn’t delivered to a gallery the furthest it gets is a Facebook post. By taking the time to post to Facebook, Pinterest, Etsy, my personal blog and the 30 Paintings in 30 Days blog I was able to have more people see my work. I plan on connecting with local and regional galleries as well as some local businesses to get this collection out of my studio and into the world. I’m going to take a break from creating small pieces (my 30 paintings were all 6 x 6 inches) and go big. I’ve been dreaming about a large piece using my sculptural waxed photography and I need to get it out of my head and onto the wall.